Outside 4 Twineham Road, with No.6 in the background. When I was in the army in Germany, I saw a lot of bubble cars, and when I came out in 1960, I thought I'll have one of those. So I bought this Isseta and it was a good little runaround. I painted it with Magicoat blue inside and I loved it. This was a 4-wheeler so I had to pay full car tax, when a 3-wheeler was half the cost. 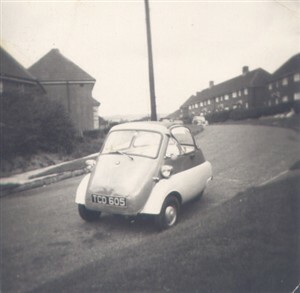 So my next bubble car was a 3-wheeler. I bought them both from Mr Cook in Holland Road, Hove. Ernest did you live at 4 Twineham Road? if so I think I can just about remember you, I lived across the other side of the road at number 5 from 1958 - 1967 when I got married. 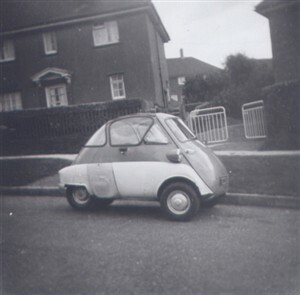 I'm certain I remember your Bubble cars as there were only a couple of people in the street that had cars at that time but I think yours were the only Bubble cars, I certainly can't remember anyone else having any then. Ernest, I've just seen your photo on your other page titled Back in Time http://www.bygones.org.uk/page_id__239.aspx which confirms that I do remember you as you hadn't changed at all from when I left Twineham Road in 1967, if I remember correctly did you live with a brother in the 60s if so do you remember the two sisters from number 5 who were land girls Colleen & Marion Roche? we both used to work on a farm in Peacehaven, also do you remember that I used to have a pony & a donkey which I sometimes would take them home to Twineham Road & let them graze in the garden for a while, on one occasion a donkey escaped & got into Mrs Longhurst's garden & ate her flowers, she was none too happy at the time!! Unfortunatly we have lost contact with Ernie Marchant. I knew him too, I lived at No 25 Fletching Road. I could'nt help noticing your comments re the Peacehaven land army. I wonder whether you have seen the item and photographs asking for information on the members of that land army unit. The item is under our Family History section. If you can help please it would be appreciated. Vic, I'm afraid I worked on the Peacehaven farm much later than the wartime Land Army Girls. My sister Colleen & I both worked for Grant Currie Limited on the farm at the back of Peacehaven during the 1960s, we had free transport to work which was an open back cattle truck, the seating were upturned bushels in the mornings & filled bushels of the vegetables that we had picked during the day going home (no health & safety in those days!). In the summer we would work in just bikinis & flip flops then dress in shorts & tee-shirts to go home, we had to work to a fixed quota & when that was done we could then go home which most days was around 2pm - 3pm from a 7am start, we very rarely waited for our transport home in the summer so we would walk down to the South Coast Road & hitchhike back to Brighton, we were often given a lift home by drivers that got to know us & never had any problems, I wouldn't recommend young girls to hitchhike nowadays! During the winter we would be picking sprouts on farms around Sussex i.e. Glynde, Telscombe, Barcombe, Southease, Thakeham etc. I worked on the land until I got married in 1967 & when I left Twineham Road. Hello, I remember Ernie as I lived at no 6 Twineham Road as a child with mum/dad and sister Sally.My mum used to foster children. I remember his bubble car too.